1. Line 2 baking trays with baking paper. Sieve the almond meal and throw away the remaining bigger bits that refuse to pass through. 2. Using an electric beater, beat the egg whites to soft peaks and gradually add the caster sugar and food colouring gel (you can add a bit more food colouring for more intense colour). Beat until sugar dissolves. Gently fold in the icing sugar and almond meal a little at a time. 3. Spoon the mixture in a piping bag fitted with a plain nozzle. Pipe 36 rounds onto the tray, spacing 2cm apart. Tap the tray on the bench 2-3 times to dispel any air bubbles. If you see any pointy peaks on top of the macarons, smooth them back with your finger. Sift over a little extra icing sugar to lightly cover the macarons and topped with a little bit of sprinkles on each macaron (you can use any type that you like). Let the macarons rest at room temperature for at least 20 minutes. 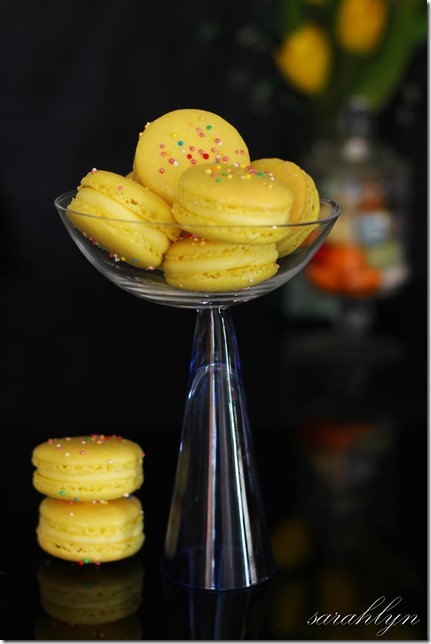 While the macarons are resting, preheat your oven to 150 degrees Celsius. 4. Bake the macarons for 14-18 minutes (depending on your oven). Macarons are ready when they look dry and firm. Sometimes you just have to test them and it might take a few goes to figure out when they’re done. If the macarons are still very soft inside, you need to bake them for a few more minutes. Cool slightly on the tray then transfer to a wire rack to cool completely. 5. Pipe the buttercream on the flat side, then sandwich together with the remaining macaron. 1. Beat butter until light and fluffy. Gradually add the icing sugar until combined. Add the lemon juice, lemon rind, vanilla, milk and food colouring gel until well combined. If the mixture is a bit hard, add a tablespoon of milk or lemon juice to get the right consistency. 1. Preheat oven to 200 degrees Celsius. Line a baking tray with aluminium foil. 2. Rub 2 tablespoons of sea salt into the pork. Place on the tray and roast for 30 minutes, then reduce to 180 degrees Celsius and roast for a further 1 hour or until crispy. 3. Ta make the salsa, place pineapple, lime leaf and chilli in a serving bowl. 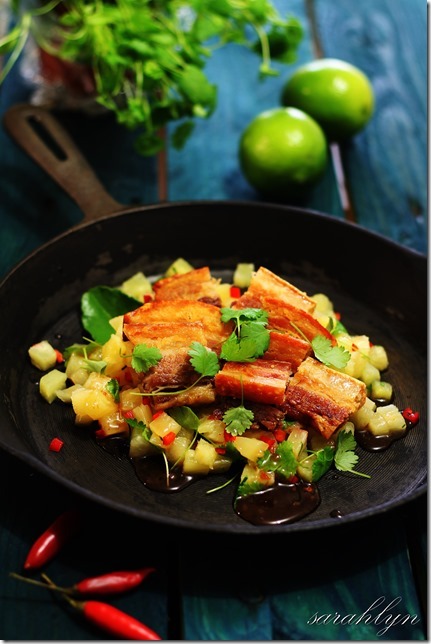 Drizzle with sweet chilli sauce. Garnish with coriander leaves. Serve with Jasmine rice. 1. Grease and line the base and side of a 25cm (base measurement) springform pan. 2. To make the coulis, bring all ingredients to a boil in a small saucepan, stirring constantly and crushing berries with the back of spoon. Boil for 2 minutes to thicken. Pour into a blender and whiz until smooth. Strain through a fine sieve into a jug. 3. Place the biscuits in the bowl of a food processor and process until finely crushed. Add the butter and process until well combined. Transfer mixture to the prepared pan. 4. Use a spoon or a straight-sided glass to spread and press mixture firmly over the base of the pan. Place in the fridge for 30 minutes to chill. 5. Soak gelatine leaves in cold water for 5 minutes. Heat milk in a pan over medium heat until just below boiling point. Squeeze excess water from the gelatine leaves and add to the hot milk, stirring until dissolved. Set aside. 6. Whiz cream cheese, sugar, condensed milk, vanilla, lemon juice and the milk mixture in a food processor until smooth. Pour mixture over biscuit base. Use a teaspoon to drizzle the coulis on top of the cheesecake and use a toothpick to create swirls. Chill for 5 hours or overnight. 7. 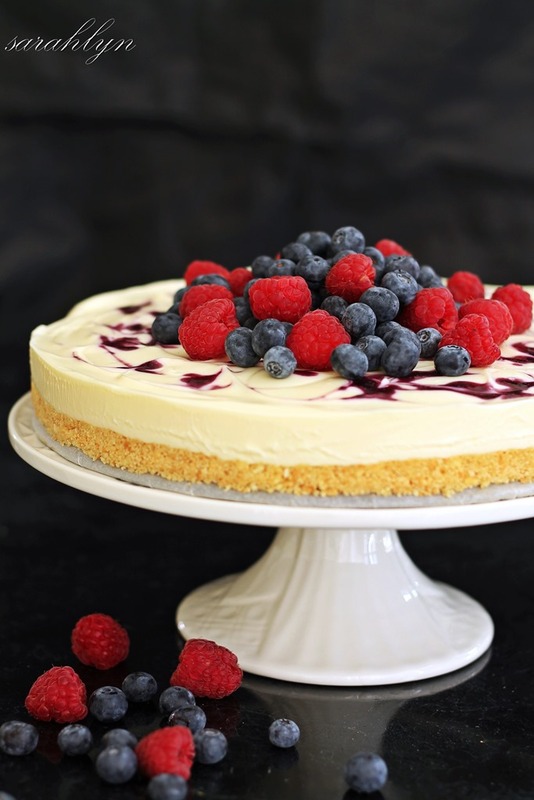 Serve the cheesecake with berries, drizzled with blueberry coulis. 1. Place flour, butter, caster sugar, chia seeds, and egg yolks in a food processor and process until mixture resembles breadcrumbs. While the motor is running, slowly add 3 tablespoons chilled water and process until the mixture comes together into a ball, adding extra water if needed. Remove from the food processor, cover with plastic wrap and chill in the fridge for 20 minutes. 2. Preheat oven to 180 degrees Celsius. Place dough between 2 sheets of baking paper. Roll the dough out into a circle until 5mm thick. Sprinkle the centre with almond meal. Arrange figs on the pastry and sprinkle with sugar. Fold the edge over the filling and roughly pleat the sides of the pastry over the figs to partially enclose, leaving the centre exposed. Place pastry on a tray lined with baking paper and bake for 40-45 minutes or until golden. Remove from the oven and cool completely. 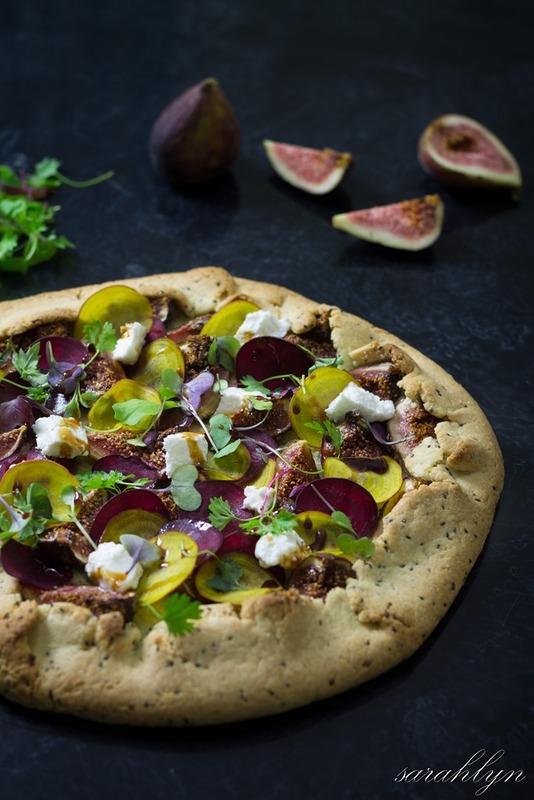 Arrange beetroot on the pastry and top with goats cheese. Drizzle with pomegranate molasses. Garnish with micro-herbs. Serve immediately. 1. Preheat oven to 200 degrees Celsius. Place the eggplant, capsicum, zucchini, onion and garlic in a roasting pan. Drizzle with oil and season with salt and pepper. Cook, turning occasionally, for 20-30 minutes or until the vegetables are tender. Remove from the oven and arrange the cherry tomatoes over the vegetables and continue roasting for a further 10 minutes or until tomatoes begin to release their juices. 2. Season the lamb with salt and pepper. Heat 2tbls of oil in a large non-stick frying pan over a high heat. 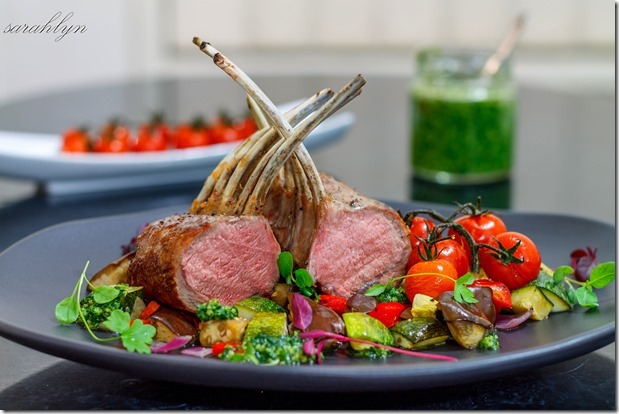 Cook the lamb racks for 2 minutes on each side or until golden brown. Transfer to a roasting pan, drizzle with oil. Roast in oven for about 20 minutes for medium or until cooked as desired. Remove from the oven and cover loosely with foil. Set aside for 5 minutes to rest. 3. To make the pesto, place basil, garlic, pine nuts and parmesan in the food processor and process until finely chopped. With the motor running, gradually add the oil until well combined and a smooth paste forms. Season to taste with salt and pepper. 4. 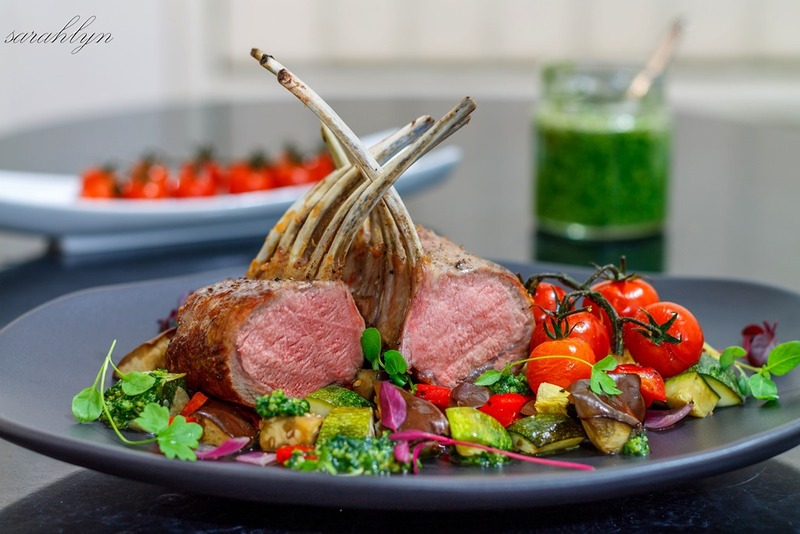 Divide the vegetables and lamb among serving plates and garnish with micro-herbs. Serve with pesto. All of the ingredients in this recipe were sourced from local suppliers here in Bendigo and represent produce typical of the Central Victorian region.